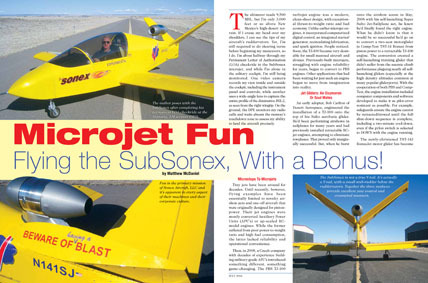 “Microjet Fun – Flying the SubSonex, with a Bonus!” can be read in the magazine’s digital edition, and on page 6 of the print edition. Matt McDaniel covers the SubSonex aircraft, the transition training process with Desert Aerospace’s BonusJet, and the SubSonex permanent LOA checkride process. With the availability of BonusJet training with the TJ-100 turbojet engine system, SubSonex pilots have an established avenue for qualifying and preparing to fly the single-place SubSonex.